Take a look at our calendar of events supporting a variety of charitable causes. The Community Foundation’s Event Calendar is powered by NowPlayingNashville.com. 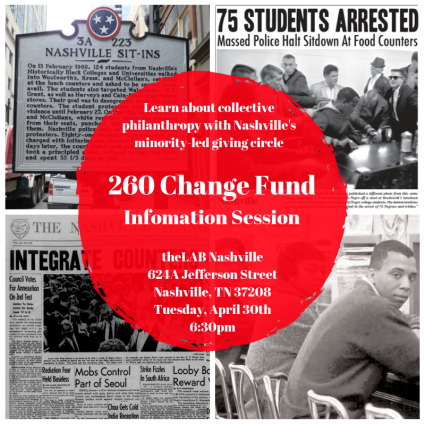 Join the 260 Change Fund to learn more about the organization and network with current members. The Fund, organized in July 2017, is a giving circle comprised of young people of color seeking to invest time, talent, treasure and testimony to uplift their community. Our fund is housed within the Community Foundation of Middle Tennessee, and we are a member of the Community Investment Network. Networking will start at 6:30pm, followed by a presentation and discussion starting at 7:00pm. Refreshments will be provided. 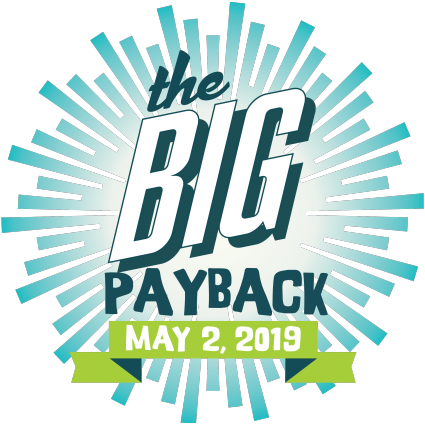 The Community Foundation of Middle Tennessee’s The Big Payback is a 24-hour, online giving event created to increase philanthropy in the 40 counties of Middle Tennessee. The goal is simple – inspire Middle Tennesseans to come together, show their pride in their communities, and contribute to support the life-changing work of local nonprofit organizations. In its first four years, The Big Payback has helped Middle Tennessee’s nonprofit community raise $9.3 million dollars for more than 750 nonprofits, including religious institutions and schools. The spirit of generosity shines bright during this annual giving event. Learn more, see a list of participating nonprofits, and learn how your nonprofit organization, school or religious institution can participate at http://thebigpayback.org. The Ben Jones Celebrity Clay Shoot is a fun day of clay shooting hosted by Tennessee Titans Center, Ben Jones, and his wife Alex to benefit area nonprofits dedicated to enriching the lives of at-risk youth. The 50-bird course clay shooting tournament will be hosted at the Nashville Gun Club, Tennessee’s premier shotgun shooting facility. All levels of play may participate, including beginners (must be 18 or older). Instruction will be available. Registration includes ammunition, an exclusive shooter gift, a delicious lunch and dinner, bottomless beverages and a cocktail and awards reception. Registration also includes eligibility in the live and silent auction as well as the opportunity to purchase raffle tickets for the big raffle item! Lastly, EVERY GROUP WILL BE ACCOMPANIED BY A PRESENT OR FORMER TITANS PLAYER! The tournament will start at 1:30 p.m. with 50 targets per participant. Prizes will be awarded for the first and second team winners in addition to a first place individual overall winner. The 2019 event will benefit The Jones Mission Fund at The Community Foundation. Join friends and neighbors for an active and fun-filled morning to show your personal commitment to staying healthy and to support Dickson County! 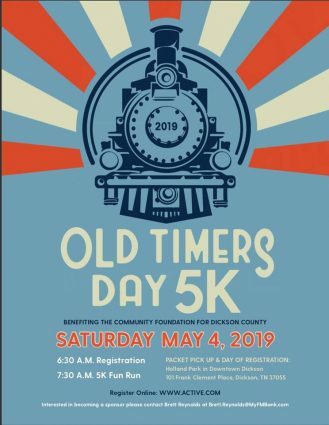 Proceeds from the Old Timers Day 5K will benefit The Community Foundation for Dickson County and the grants it has distributed to nonprofit organizations and schools across the community since 1999. The top male and top female runner will each win $100 in cash! Top runners in each age group will also receive a gift card to a local business or restaurant. Age groups are as follows: 12 & Under, 13-19, 20s, 30s, 40s, 50s, 60s, 70 & Up. 5K runners start in front of Holland Park, headed west toward Main Street. Turn left onto Main, right onto Chestnut, right onto North Charlotte. The one-mile mark is just before you get to Henslee Drive (Hwy 70). Turn left onto Henslee. The two-mile mark is just before College Street. Turn left onto College, left onto Mulberry, right onto Murrell, right onto Main Street. The three-mile mark is on Main Street between Murrell and College. The finish line is on Main Street in front of Fussell’s Store. Late and Day Of Registration will be $35. All race participants, including children, will be required to pay the registration fee due to the charitable fundraising efforts for the fund. The only exception is for children in strollers or carriers who are with a parent participating in the run. 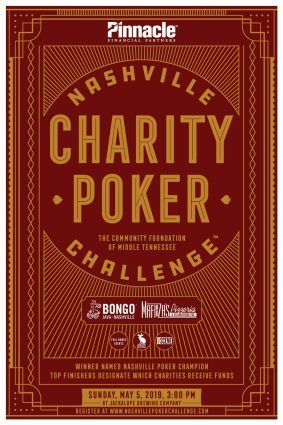 Join The Community Foundation of Middle Tennessee for the inaugural Nashville Charity Poker Challenge, presented by Bongo Java and MAFIAoZA'S. The event is co-written by Pinnacle Bank, Jackalope and Full House. Winner of the Challenge will be named Nashville Poker Champion, complete with photo in Nashville Scene! All entry fees go to charity with top place finishers determining which charities receive the funds.&nbsp;Since it's all for charity, ReBuys are allowed and encouraged. Entry fee will include a drink ticket and food provided by Bongo Java and MAFIAoZA'S. Additional food and drink will be available for purchase. Watchers welcome! 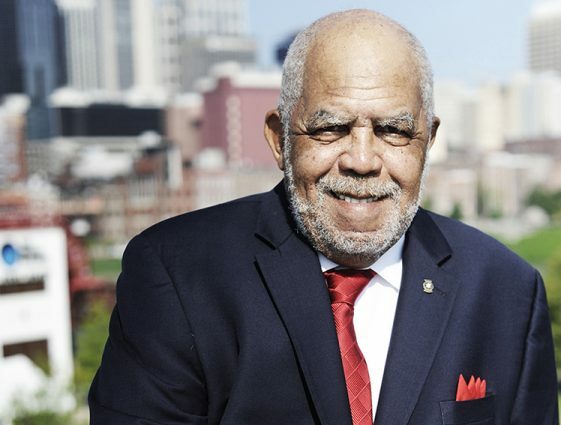 The Francis S. Guess Bridge to Equality Fund Luncheon is hosted by the Music City Center in the Davidson Room on Thursday, May 23 from 11:30 a.m. - 1:30 p.m.
Francis S. Guess served this community with vigor, commitment and pride for decades. He found his own bridge to equality, and then created the same opportunities for others throughout the country and here at home. No one who knew him can imagine what Nashville would have been like without Francis S. Guess. The child raised in public housing became the man whose fingerprints can be found on almost every major civic effort in our community. Throughout his distinguished life, Francis S. Guess’ body of work has included the widest range of worthy causes from economic development to the preservation of musical heritage to investment in the human condition. He has served on the National Civil Rights Commission; has acted as Commissioner for the Tennessee departments of Labor and General Services under then Governor Lamar Alexander; and has provided volunteer support to more than 100 organizations. As a community we honor his memory with gratitude for his many accomplishments. And to ensure that his efforts continue, The Francis S. Guess Bridge to Equality Fund has been created to help provide equal access to the American Dream, in perpetuity.